Bloomberg News can be considered rather good in many fields of journalism. Except, it seems, when reporting on Apple’s iPhone. According to many recent articles from the news company, the new iPhone 5 will have every new feature that geeks have been wanting for months. In fact, the supposed list of features reads a lot like all the rumors that geeks have been wondering about. That’s because they’re the exact same list. It seems that this trusted news source went online and Google’d “iPhone 5 rumors” and just printed everything they read as gospel truth. They even went so far as to compare how this new iPhone will rank against current phones such as the Nexus 4G. Promising that the new iPhone will have a radically curved screen, they even point out a picture that a source has provided them of the new phone! That source? Someone’s flickr stream. That phone? Um, that’s a mouse people. But how can ALL the rumors be true when some of the rumors completely contradict other rumors. Bloomberg has that figured out as well; there will be TWO phones! See, this way one phone can have all the features from one part of the list, and the other phone can have all the features the first one doesn’t! Now, I don’t claim to be a news site here. We are a “Geek Blog” that occasionally references the news. However, even I have know how Bloomberg should be reporting! Don’t just make crap up! Don’t cite sources when the sources are obviously making crap up! 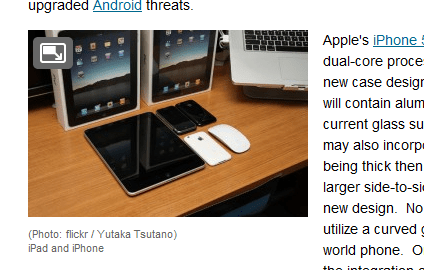 Reading down a forum topic at MacRumor is not the same as “a source”. That’s like hearing what someone in a checkout line at the store is saying about the government and then reporting that as fact. If you ARE going to make crap up and report on it, at least do it the same time everyone else does. This way you can always go back and say you were mistaken (along with everyone else). Don’t write stuff like this MONTHS after everyone else debunked the rumors! This would be like reporting that Hollywood is looking forward to a Halo movie soon and that Peter Jackson is somehow involved. Ah, We Can Finally See the Medic! Remember When Marvell Only Made Awesome Movies?